What is falconry? 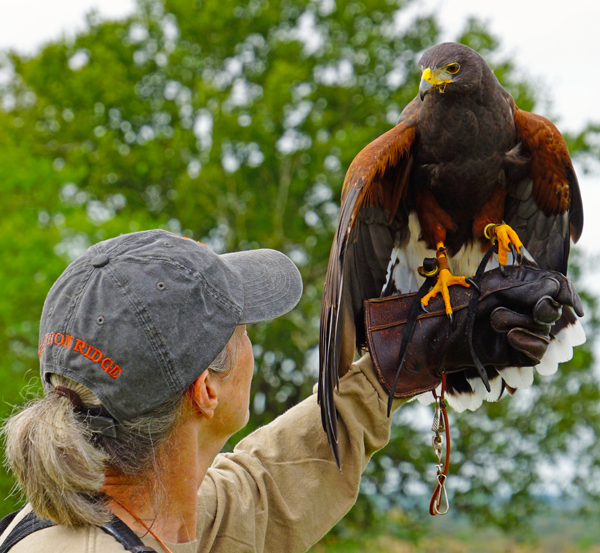 Falconry is the practice of caring for, training, and hunting with birds of prey, also known as raptors, and all of the preparation, housing requirements, and equipment-making which goes with that practice. Can you tell me about your raptor? His name is D’Artagnan, but I call him Dart and that is the name he knows. He is 6 years old. If he stays healthy – and his health is my responsibility – he can live to be 20 to 35 years old in captivity. What kind of hawk/falcon is your raptor? 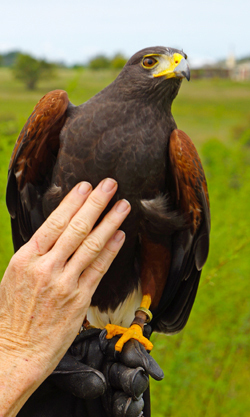 Dart is a Harris’ Hawk, which is a type of broadwing hawk, and he is a captive bred bird. 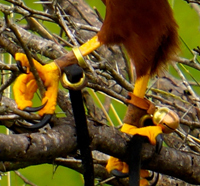 In nature, Harris’ Hawks are indigenous to the southwest area of the United States, northern Mexico and Central America, and into the southwest part of South America. What is Dart’s personality like? Dart has a funny personality. He makes odd little noises, some of which are very loud. One reason I have him is because his prior falconer lived in the city limits and having a hawk that screams as much as Dart does can create problems in that environment. I live in rural Texas and Dart has his own house (or mews) behind my house. No one cares whether he screams all day or all night in the country! Dart is a great hunter in the open-prairie type of country I have available in which to hunt. He loves to catch rabbits, rats, mice, and small birds. He is affectionate in a “birdy” sort of way and will sit happily on my knee if given the opportunity to do so. He likes hunting with my pointing Labrador Retriever, Max. I think we three make a good team! 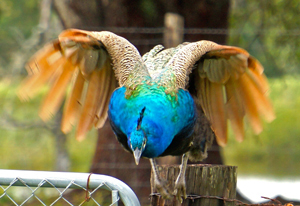 Don’t mess with peafowl – even if you’re a hawk! What does Dart like to hunt? His favorite prey is a small rat called a cotton rat, which is indigenous to Texas, but Dart will try to take anything that he thinks he is big enough to capture and kill. This can be a problem. He attacks my adult peafowl if given the chance, which is not good for either Dart or the peafowl! They outweigh him by about 9 pounds and they always win. Once Dart attacked a full grown black-headed vulture. Neither was hurt, but the vulture threw up on Dart and that was awful! Vomiting on an attacker is a vulture’s first line of defense, and believe me, it is VERY effective. I could barely stand to be within thirty feet of Dart. He looked miserable. I had to mix up a skunk mixture to remove the smell and it still took weeks to go away! What does Dart eat? Dart eats what he catches, but he prefers rats. He also loves rabbits and birds. Where does your raptor live? Dart lives in his mews, which is an old term with a meaning similar to stables. My mews was designed and built by my husband and me, and it is a 10 by 16 foot structure. Dart has three perches and he is not tethered, or tied, to his perch. Falconers call this freedom in the mews being free-lofted. Why do hawks wear bells? Hawks in the wild fly very silently. That ability keeps prey from knowing that the raptors are coming. They also are very athletic and can perform all kinds of aerial maneuvers. The bells are to help the falconer find his hawk when out in the field! Are you ever worried your raptor will fly away and not come back? I absolutely worry that my hawk will disappear. Nothing attaches Dart to me when he is flying. He could leave if he wanted to leave. This fact is why most falconers have invested in relatively expensive telemetry equipment. My hawk wears a transmitter at all times. I turn it on when I am flying him and turn it off when he is not hunting. Fortunately, most of these incidents are avoided by training, which I will explain later. I have, thankfully, never lost a hawk. What does it feel like to train a raptor? My first raptor was a wild-caught red-tailed hawk that I named Artemis. (The law requires that an apprentice falconer capture and train a wild-caught raptor that has a large natural population for two years before the apprentice can legally become a licensed falconer.) I caught him myself and trained him. The first step was to get him used to me, so for the first few days that I worked with Artemis, I went into his room in the dark, sat down beside him as he was tethered to his perch, and slipped my gloved fist under his feet and lifted him off of the perch. For about four days, every time I put him on my fist, he squeezed my hand with his feet and talons so hard that it almost made me cry. His talons could not pierce the very thick glove I was wearing, but the sheer pressure of him squeezing my hand was extremely painful. If I had tried to do the same thing in a lighted room, he would have simply tried to fly away and could have hurt himself or damaged some feathers. This initial method of training him was to show him that I was not a dangerous creature who was going to try and eat him. Artemis voluntarily stepped to my gloved fist for some red rabbit meat several days later. I was stunned and thrilled and also scared. Once he stepped willingly to my fist without trying to escape and without trying to crush my hand, I had penetrated a giant barrier in terms of creating a relationship with my wild hawk. This first critical step meant that he trusted me not to hurt him and he trusted that I would provide him food. The fact that it happened so very quickly — in just a few days — was astounding to me and created a bond between my hawk and me that, for me, was a feeling I will never forget. Did it take a long time to train your raptor? After I trapped Artemis, his first free flight was approximately six weeks later. The day after his first free flight, he successfully caught a cotton-tail rabbit on our first hunt together. What was the hardest part of training your raptor? 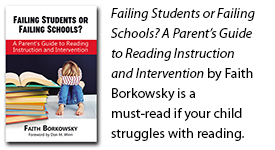 For me, the hardest part was realizing that I was going to be alone in a room with a wild hawk. Although I had been coached and had handled other falconers’ birds of prey by the time I trapped Artemis there is no feeling quite like the one that occurs when you walk in the room and a wild bird of prey is staring you in the eyes. What kind of person makes a good falconer? In my opinion, a person who is a good hawker is someone who puts the needs of their raptors first and provides good quality care, shelter, equipment, training, and most of all, someone who is willing and able to spend the time in the field hunting with their hawks. Would you say that falconry is like a glimpse back in time? I would definitely say that hawking is a glimpse back in time. In medieval days a Goshawk could provide food to supplement the diet of a family of four during the winter. Trained raptors are efficient hunters, and as long as they don’t feel cheated, they don’t mind giving up what they have caught. Dart frequently catches something that is larger than he can eat in one setting, as all raptors do. I reward him with different food and quietly transfer him off of the prey I don’t want him to eat in the field. If I want to hunt with Dart for several hours and the prey is abundant, I feed him just enough during the hunt to keep him interested. Once a hawk feels full, or cropped-up, he quickly loses interest in following the falconer, so the process is a delicate balance. Wandering around in the wild for hours with only a hawk and a dog for company heightens a falconer’s senses about everything around him. Imagining the same process in a time when there were no machines and no industry to speak of is not a far stretch of the imagination when I am walking around with my hawk. What has changed about hawking since medieval times? In my mind, the biggest and most obvious changes involve the knowledge that we now have of veterinary medicine for birds of prey and the technology which helps us to maintain, hunt, breed, and prioritize the safety of our hawks. A less obvious, but maybe more important change is the fact that through proper preparation, study, and commitment, almost anyone can be a falconer in the United States. Is there anything else you would like to share? Falconry is a great part of my life and I am so happy to have found this wonderful passion. I wish everyone could experience the joy and the thrill of handling a bird of prey, of hunting with him, of having him look into your eyes as a superior predator, and of having such a fabulous creature as a partner in a hunt in the wild. I’d like to share the feeling of my hawk trusting me to approach him when he is on prey, and to experience the knowledge that a falconry bird of prey flies free to go wherever he chooses, and that so far, he has always come back to me. Hanging out at the ranch. Way cool! Love your use of Lizzie’s pictures!!!!!!!!!!!!!!! This is so fun and I am so thrilled to be a part of it!! Thanks Lynne, it was a great interview and the pictures made it even better!